Supporters on the Gerhart property, March 28, 2016. Photo by Michael Bagdes-Canning. On Wednesday, May 9th, several members of Marcellus Outreach Butler made the 130-mile trek to Huntingdon, Pennsylvania, the seat of the county of the same name. We were there to support Ellen Gerhart, a retired-teacher-turned-pipeline-fighter, for what was scheduled to be her day in court. You see, Ellen has a pipeline running through her property, and she and her family don’t want it there. But Sunoco, who is building the pipeline known as Mariner East 2, put it there anyway. Ellen and her daughter, Elise, have been fighting Sunoco for more than two years after the state Public Utility Commission declared Sunoco to be a public utility, thus granting them the power of eminent domain for the project. When Ellen and her husband refused to sign a right-of-way agreement for their 27-acre forested property in Huntingdon County, Sunoco simply condemned more than three acres of the property, including a pond and wetlands. Unwilling to take this sitting down, Ellen and Elise challenged the taking in court, and their story soon made state and national headlines. 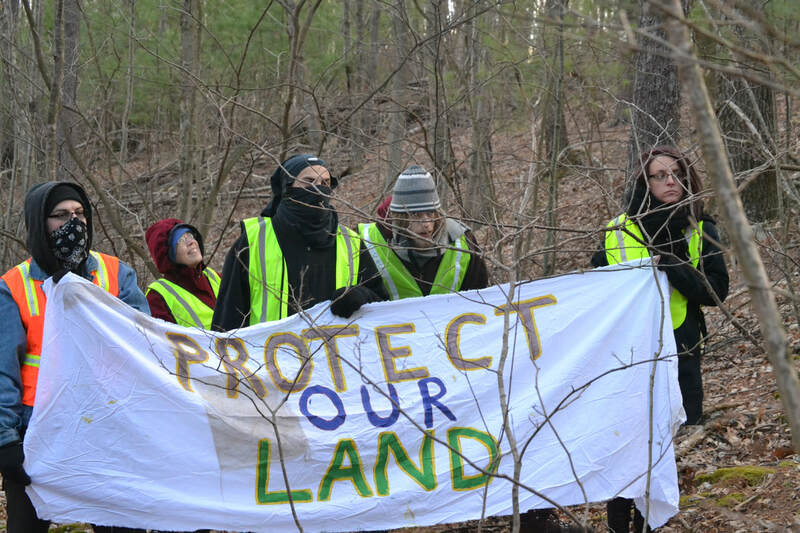 Supporters from across the country descended on the property to support the Gerharts, and a resistance camp, appropriately named Camp White Pine, was built on the property. Tree-sits ensued, with several protestors, including Elise, camping high in the treetops for more than two years to stop tree-clearing crews from cutting the trees down. Energy Transfer Partners, the contractor building the pipeline, and their private security firm, TigerSwan, together with state and local police, began constant surveillance of the property, trying to find a moment to force their way onto their illegitimate and ill-gotten right-of-way. After several conflicts, and even the arrest of Ellen, Elise, and two other protestors, the trees were only just cut down at the beginning of April, after more than two years of delay. The trees had been occupied by tree sitters the previous evening, but they came down due to high winds, giving Sunoco, which was watching closely, just enough time to sneak in and destroy the trees before dawn on April 8th. It is truly sad that we have come to this point in Pennsylvania. If you didn’t already know it, the Gerharts’ fight has all but proved who really holds the power in this state. In the face of super corporations like Sunoco, regular people like you and I, and the Gerharts, don’t stand a chance. We are expendable, and we have a bad habit of getting in the way of their carefully laid plans. Their pockets are deep, and ours are shallow. They can afford to wine and dine our legislators, and we can’t. Often, we can’t even speak to them. Thankfully, companies like XTO and bankruptcy-crippled Rex (see below) haven’t been granted public utility status, and so can’t use eminent domain to shove their collection and transmission pipelines down our throats here in Butler County. But unfortunately, we have enough people who are more than happy to sign on the dotted line of their own volition. So while you may not want to sign a right-of-way for a pipeline now, how long will it be until your property is like the Gerharts’, with a pipeline running through it, whether you want it or not? PENN TWP—A fracking tanker rolled onto a car on May 19, injuring the three occupants and the driver of the truck. The tanker, owned by Force, Inc., was travelling north on Route 8 when the driver attempted to turn right onto Dinnerbell Road. The driver, Shawn Kepple, did not make the turn, and the truck rolled onto a Chevrolet Camaro that was stopped at the traffic light at the intersection. The driver of the car, Kevin Koontz of Mars, sustained significant injuries and had to be taken to Pittsburgh by Life Flight. His two daughters, ages 7 and 9, escaped with minor injuries but were badly shaken. It has been reported that the truck was carrying fresh water to a well pad near Saxonburg. It is unknown if anything was spilled when the truck rolled over. Police are investigating mechanical failure and driver error as possible causes of the wreck. CRANBERRY TWP—Rex Energy, which maintains a regional office in the township, is filing for Chapter 11 bankruptcy. The largest operator in Butler County, with more than 200 wells on 70 pads, officially filed with the U.S. Securities and Exchange Commission last week. The State College-based company said that it plans to sell off most of its assets, and it is unclear at this time if royalty payments to leaseholders will continue. Rex is responsible for three of the biggest atrocities committed by the gas industry in Butler County. They contaminated the groundwater in the Woodlands in Connoquenessing Township in 2011, and more than 50 families are still without drinkable water. Rex is also behind the heinous Geyer well pad in Middlesex Township, which is less than 1 mile from all five schools in the Mars School District, putting thousands of students at risk, as well as the residents of the nearby Weatherburn residential development. Rex is responsible for the proposed Krendale well pad in Butler Township as well, which has yet to be constructed. The future of that project is now unclear. Chapter 11 does not mean that the company is going out of business, but rather is restructuring and consolidating its debts and assets, so Rex may yet return. PROSPECT BORO—XTO Energy was issued two well permits on May 3 for the Coretsky well pad on Crown Hill Road, within borough boundaries. It will be the first in the borough, making Prospect the second borough in Butler County to have a well pad within its borders. The other is Connoquenessing. CONNOQUENESSING TWP—Rex was issued a violation on May 18 for a spill on the Bloom well pad on Whitestown Road. The embattled company was given three citations regarding disposal, processing, and storage of a residual waste; management of residual waste; and unlawful conduct. The DEP violation indicated that “[A] person disposed, processed, stored, or permitted the disposal, processing or storage of residual waste in a manner which is contrary to the rules and regulations of DEP or to any permit.” The spill occurred during the fracking stage of a well drilled in March. JEFFERSON TWP—The fracking stage is currently under way at the Christensen well pad on Saxonburg Road. The well pad belongs to XTO, and the wells were drilled in 2017. CENTER TWP—Fracking is occurring on the Kern well pad on West Brewster Road, just off Benbrook Road. The Rex pad was built and drilled last year. PITTSBURGH—XTO Energy has reached a settlement with disgruntled leaseholders. The settlement ends a lawsuit initiated by the Marburger and Thiele families in Butler County. XTO will pay more than $11 million to 1,100 leaseholders who had originally signed leases in 2007 with Phillips Production Company, an arm of the former Butler-based T.W. Phillips Gas and Oil Company. XTO bought out Phillips’ production unit in 2011, including existing leases. These leaseholders alleged that XTO has been deducting operating expenses from their royalty payments for the last five years, which constituted a breach of contract. Each of the 1,135 leaseholders will receive $500 automatically, with more money to be allotted based on a “proportionate share of post production.” The settlement prevented the class action lawsuit from going to trial. Read more here. HARRISBURG—The Pennsylvania Superior Court has ruled that a gas company taking gas from beneath a property it has not leased is trespass. The Briggs family of Harford Township, Susquehanna County, first took Southwestern Energy to court in 2015, after the company began extracting gas from beneath their property from a well pad on a neighboring property in 2011. The company never disputed that it was taking gas from beneath the Briggs’ property without a lease, but claimed that it was legal under the “rule of capture,” which holds that the first person or entity to “capture” a natural resource like gas, oil, or groundwater owns the entire pocket, regardless of property lines on the surface. Lower courts had sided with Southwestern, but the Superior Court disagreed, saying that the “rule of capture” only applied to traditional oil and gas reservoirs that existed in a liquid state below the surface. Because gas in the Marcellus shale is trapped within a rock formation, it is non-migratory, and therefore not subject to the rule of capture. As such, removal of the gas without a lease, even a mile below the surface, constitutes trespass. Read more here.